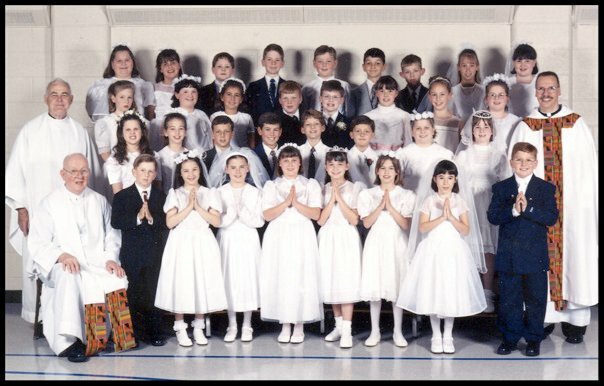 My little brother’s first communion class at St. Bernadette. I didn’t have a photo of mine. They say you can’t go home again, but I think we never want to until home disappears. I’m a refugee from a country that no longer exists. I won’t pretend I loved you when I had you. Like all lost romances, you look better from a rose-colored distance. In my mind’s age-unreliable eye, I remember hallways that echoed with a cacophony of laughter and children’s chatter. Our classrooms smelled like yellow chalk and the ammonia we used to clean the blackboards. Sixth grade. Mrs. C taught us to wipe the sponge, so big it took two hands, in clean, vertical lines that overlapped at the edges. She hated a streaky blackboard, but gave homework passes for a job well done. I hoarded them, for an assignment I couldn’t handle, but never handed one in. A stack lived in my desk drawer for years. A crucifix hung above each blackboard, next to the flag, and we worshipped both of those equally, it seemed. We stood when the principal entered the room, when a priest did, because those figures demanded respect. We greeted them in unison: Sister. Father. We were a family of plaid-clothed children, living together from kindergarten to 8th grade, and we knew each other better than our siblings, sometimes. Our teachers might have been our parents, and had the same right to discipline us, too. There were standards, there. There were consequences for our actions. We knew it. Lived by it. It seems the halls echoed with reverence for more than Catholicism and the Golden Rule it stood for: for each other and education, although we didn’t know it then. We never know what we’ve learned until it settles in our bones. Until years pass and we gain the perspective distance brings. Your closure brought an urgency, and now I’m shouting sentiments I didn’t say, when someone could have heard them. I remember when the new middle school wing opened. That first day of fifth grade, Sister Diane stood in front of the main entrance with a boombox blasting “Schoolhouse Rock.” She wore oversize sunglasses with her habit and the widest smile I’d ever seen. We were allowed to run down the new halls, still ripe with fresh paint. The novelty stung our nostrils. Our desks felt sacred, without names scratched into their faces. That day, it felt like you would live forever. It felt like we would, too. Those names feel like hieroglyphics now, as I read your name like an obituary heading. Like a soldier in a list of dead on the diocese website, and I mourn with 2,000 others who have lost their earliest homes. How odd that we spent eight hours each day, five days a week for nine years in that building, and didn’t claim it as our home. Not until it came to locks, to blows. And I think about our team name, The Blazers, seen most often rippling against gym walls on tournament banners, on prepubescent chests beating buzzers in basketball games, on my own cheerleading uniform when I still wore turtlenecks between my pom poms. I think of blazes, as social media ignites with my former classmates, names I haven’t seen in a decade. Cries of outrage, of sadness, of loss as we blaze one last time across the interconnected stratosphere, as if our mutual loss will burn brightly enough to outlast our first fortress. As if we’ve already burned more brightly than those first beginnings, ourselves the lasting blazes, leaving our mark on a world in which now, orphaned candles, we must burn a solitary light.